There are dozens of restaurants to dine along the riverwalk in San Antonio. Almost all of them have outdoor patios to take advantage of the gorgeous south Texas weather and views of the river. The riverwalk in general is colorful, it’s lively and it’s bustling. People walk through the dining patios getting to their destinations. Birds are fluttering around everywhere you look. The riverwalk is full of life and energy making it a perfect spot to take a seat and enjoy a meal. My Noni and I ate at three different restaurants, two of which I’m spotlighting today! Rita’s on the River is a must-visit restaurant in San Antonio according to plenty of food round-ups. They serve up Tex-Mex and Mexican food including margaritas and fajitas featuring homemade tortillas. They have gluten free and vegetarian options so even those with dietary restrictions can enjoy a local favorite. Rita’s is also fur-friendly! They welcome friendly pups in case you’re traveling with a four-legged friend or visiting friends or family with one. Overall, Rita’s on the River has a fun, welcoming environment for a great experience and the food is fantastic as well. My Noni order the Taco Salad: a large taco shell filled with your choice of chicken or beef, fresh lettuce, topped with diced tomatoes, cheese, guacamole and sour cream. Her eyes were way bigger than her stomach and she took half of it home but she loved it. I actually haven’t seen her eat as much as she ate while we were in San Antonio. It was hilarious. Not usually one for Mexican or Tex Mex either, she was really impressed with Rita’s. We loved being able to sit on the patio and people watch. She also tried guacamole for the first time! I was so proud of her for getting out of her comfort zone during our first dinner in Texas. I had the Chicken Flautas: three crispy rolled tortillas, stuffed with shredded chicken and a hint of cheese, fried to perfection and served with sour cream. They came with refried beans and fiesta rice. There’s nothing mind blowing about flautas, they’re pretty standard when it comes to Tex Mex but it doesn’t mean they weren’t delicious. It was exactly what I wanted and that Fiesta Rice was amazing! I love rice but am not the best at making it myself so it’s a treat when I have it at restaurants. One of the last restaurants we ate at while in San Antonio was the Hard Rock Cafe. Just a tad farther down the river than Rita’s the Hard Rock Cafe is like any you’d find anywhere else in the world. We weren’t looking for much, just a snack and dessert. We were under the impression that there would be a river parade that night which was the whole reason we chose this particular spot. Spoiler alert: there was no river parade. We still had a great time though! We had a visit from a friendly family of ducks that my Noni just loved. 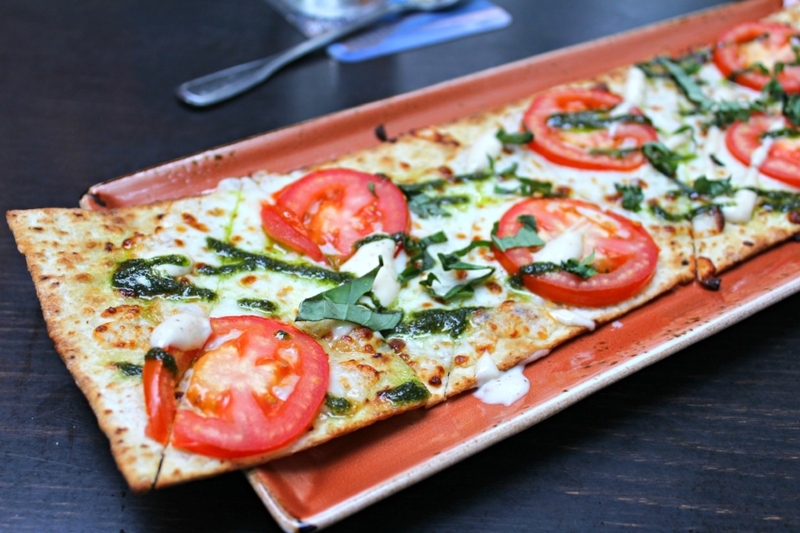 For our “snack,” we ordered the Margherita Flatbread: crispy flatbread with sliced Roma tomatoes, basil and herb sauce, roasted garlic, romano and mozzarella cheeses, fresh basil and a drizzle of garlic aioli. It was enough for the two of us and quite tasty I might say. But let’s be honest. We really came for the dessert. We split the Homemade Apple Cobbler: thick, juicy apples are mixed with the finest spices and baked until golden brown. 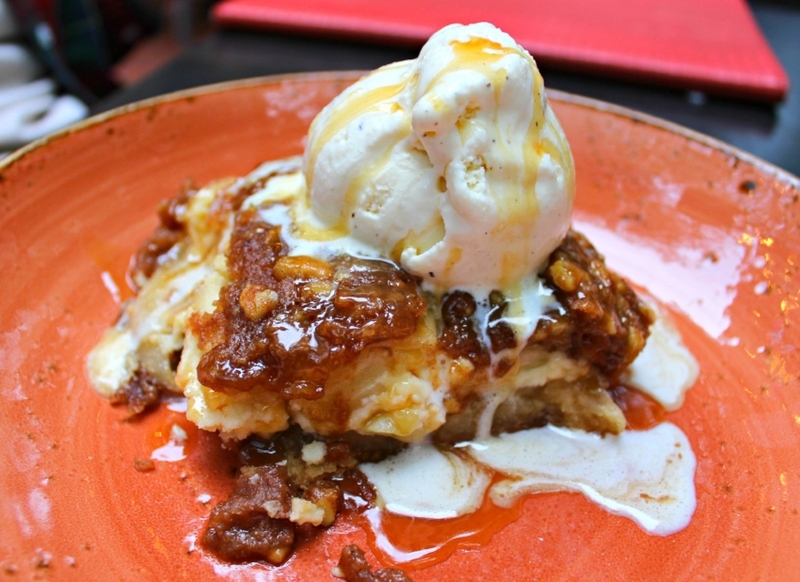 Served warm with vanilla ice cream, topped with walnuts and Ghirardelli caramel sauce. 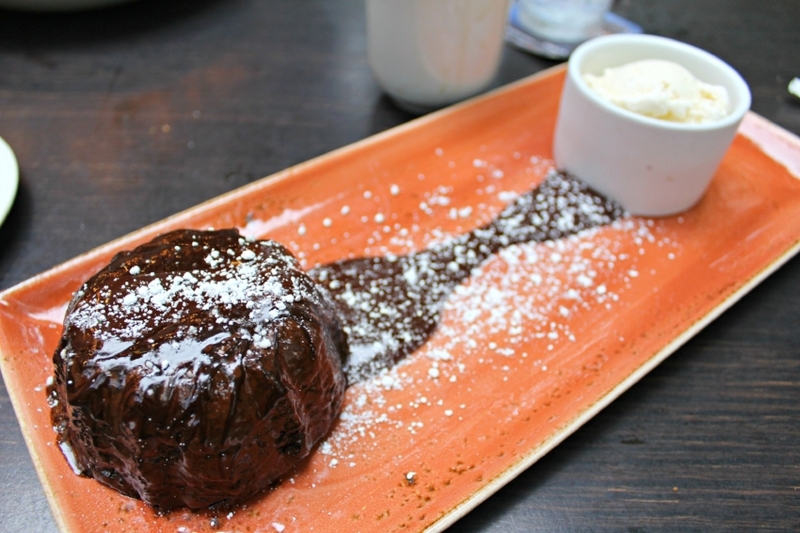 And we also split a Molten Fudge Cake with Vanilla Ice Cream that doesn’t look to be on their menu anymore. They do have a Brownie a la Mode type of treat though which is similar. Both were AMAZING. I don’t prefer caramel sauce so I went for the cake more but it was a nice balance of fruitiness and decadent chocolate. It’s a great thing both desserts come with vanilla ice cream because it helps with the sweetness. Let’s just say, we both left with a very satisfied sweet tooth. With the amount of options there are to dine on the riverwalk, it can be a bit intimidating to choose where to eat. I would suggest going with your taste buds and your budget. Some restaurants are much more affordable than others like every other city in the world. Some are more casual, some are more adventurous. It just depends on your persona taste. There’s one more riverwalk restaurant I’ll be sharing and a fourth restaurant not on the riverwalk but by far my favorite from this particular visit to San Antonio. Stay tuned!